Yammer plans to roll out an integration with the SkyDrive Pro cloud storage product and the Office Web Apps Web-hosted productivity application suite this summer. The initiative is part of Yammer's ongoing push to deepen and extend the integration of its cloud-hosted enterprise social-networking software with products from Microsoft, which acquired Yammer last July for US$1.2 billion. 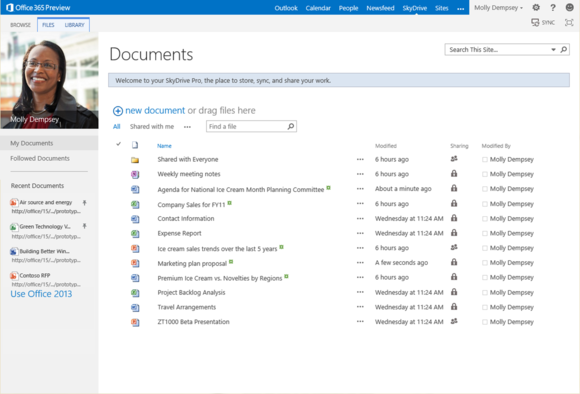 SkyDrive Pro, an enterprise version of the consumer SkyDrive cloud storage service, will become Yammer's underlying file-storage platform for Yammer, Microsoft said on Wednesday. The link with Office Web Apps, a browser-based version of the Office suite, will let Yammer users preview and edit documents from applications like Word and Excel right from within the Yammer activity stream interface. "These new capabilities will improve users' ability to create and collaborate on content, as well as share and discover it, within Yammer," said David Sacks, Yammer co-founder and Office Division corporate vice president. Yammer, which provides Twitter-like and Facebook-like functionality adapted for workplace collaboration, had a level of integration with Microsoft products like SharePoint and Dynamics prior to the acquisition. However, Microsoft plans to tightly connect Yammer with many of its collaboration products and business applications. In November at its SharePoint Conference, Microsoft said that the plans include giving Yammer and SharePoint unified user identity, combined document management and aggregation of their respective notification feeds. Prior to its Yammer acquisition, Microsoft was seen as lagging in adding enterprise social collaboration to SharePoint and its other enterprise products like Office. It is widely accepted that demand for enterprise social software is growing strongly, as companies bet on the promise that employee collaboration and communication will benefit from giving them tools to do things like set up profiles, aggregate notifications from peers and groups in activity streams, set up online communities, participate in discussion forums, share and co-edit documents and do microblogging. For example, IDC expects that between 2011 and 2016 the compound annual growth rate in spending on enterprise social software will hit 42.4 percent, taking spending from $767.4 million in 2011 to almost $4.5 billion in 2016. However, warnings about failed implementations of this type of software are becoming more common. Gartner recently forecast that through 2015, a staggering 80 percent of social business efforts will fail to achieve their intended benefits, due to what the company called "inadequate leadership and an overemphasis on technology." At the same time, Gartner predicted that by 2016, 50 percent of large organizations will have internal enterprise social networks, of which 30 percent will be considered "as essential as email and telephones are today." Microsoft said on Wednesday that Yammer almost tripled its sales in its 2012 fiscal year, compared with 2011, and that it quadrupled them in the fourth quarter year-on-year, but it didn't provide specific dollar figures for Yammer's revenue. It also said that Yammer increased its paying customers 165 percent in 2012, and topped 7 million registered users. Among the new customer wins in the fourth quarter are GlaxoSmithKline, TGI Friday's and Woolworths.